Velda Mae (Rowe) Robson was born July 10, 1926 to A.W. and Katie (Sexton) Rowe in Solomon Kansas. She graduated from Abilene High School in the Class of 1944. Following graduation she worked at Abilene National Bank. On March 8, 1946 she married Bruce Robson. They spent their married life in Abilene. She was a home maker and part time bookkeeper for Northside 66, Northside Oil Company, and Northside Auto Parts. 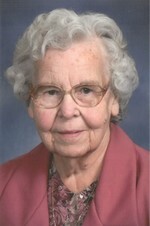 She was a faithful member of Emmanuel United Methodist Church. Velda passed away Sunday, April 15, 2018 at the Good Samaritan Society in Ellsworth, Kansas. She is survived by her son Ken and daughter in law Alice. Also survived by her grandsons Andy (Dayna) and Kirk (Janelle), and great grandchildren Brielle Mae, Aleigh, Silas, Austin, Sarah, Callen, in-laws Phyllis Rowe, Marie Burchard, and Tom and Elaine Robson. She was preceded in death by her parents, her husband Bruce on September 7, 1995, her great grandson Eli, and her brother Willis Rowe. Funeral services for Velda will be 10:00 AM Thursday, April 19, 2018 at Emmanuel United Methodist Church with Reverend Gordon McClure officiating. Velda’s family will receive friends from 6:00 PM – 7:30 PM on Wednesday evening at the funeral home. Her final resting place will be in the Abilene Cemetery. Memorials may be made in her name to Emmanuel United Methodist Church, Garten Countryside, or to the Good Samaritan Society and may be sent in care of the Martin-Becker-Carlson Funeral Home, 414 NW 3rd, Abilene, Kansas 67410. To send flowers to the family of Velda Mae Robson (Rowe), please visit our Heartfelt Sympathies Store.